If you are a teacher interested in requesting a field trip for your class, please choose the corresponding class grade below and review all steps of the curriculum. Once you have reviewed all steps, fill out and submit the Field Trip Request Form. Forms must be submitted three weeks prior to requested field trip date. Please allow up to 3 business days for a response from MCE staff. Visit the Metro Safety Bee site and review the bus, rail and bike safety rules with your students. The Metro Safety Bee site features games and a safety quiz for students grades 1-3. Visit the Metro Safety for Kids Interactive site and review the safety rules with your students. The Metro Safety for Kids Interactive site features games, videos and a safety quiz for students grades 4-5.
Review the Rules and Regulations for Riding the Metro System with your students and take the test. PLEASE NOTE: the entire Trip Request form must be completed in order for your request to be processed. 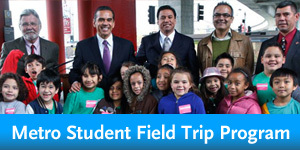 Once Metro receives your completed form, a representative from Metro Community Education will contact you within 3 business days to discuss available field trip dates.